Beautiful beach front with direct access. Close enough to hear the waves without stepping on the beach. Wonderful views of the beach and sea. Each end of the beach is surrounded by hills covered in grass and trees. The layout of the house provides lots of living spaces with a central living area from the entrance to the beach front windows. Each level has a separate living area with a view of the beach and beyond. By the pool there is a covered patio and in front overlooking the beach there is a large wooden round table or the front patio to enjoy. Bond payment also applies for this property. A beautifully designed property in post modern style. Located on a great beach ideal for many activities. Relax in the beach front spa with your favourite drink and watch the beach walkers, swimmers and boats from the comfort of the spa. Cool off in the private pool or just enjoy the numerous spaces both inside and out. 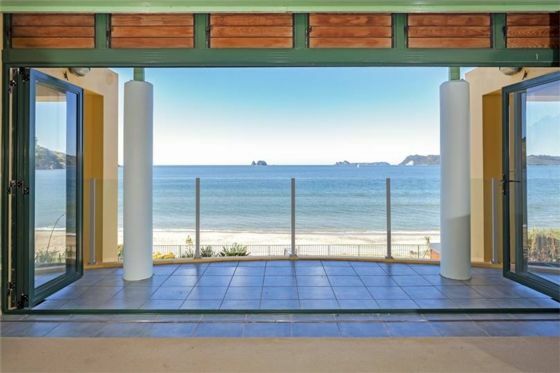 Absolute beach front quality property with the space to enjoy sharing with the whole family. Very beautiful house and location.